If you live or work in the Greater Madison area, you share our pride in being part of an eclectic community that has earned accolades in so many areas. From tried-and-true rankings such as "best in business" to national press from publications that are fond of our foodie culture, our destination has earned many distinctions. As a result, our reputation is growing as a premier meeting and convention city. And we&apos;d like your help in creating more connections. 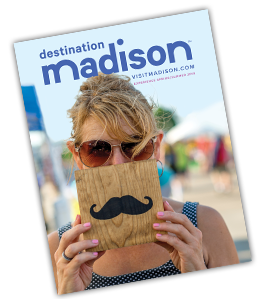 Destination Madison launched the Bring Your Meeting Home (BYMH) initiative to secure more regional, national and international conventions for our community. By matching your industry contacts with our city&apos;s amenities, we can work together to create the kind of economic impact that improves resident income, job creation and quality of life at the same time. Last year, visitor spending brought nearly $2.0 billion in new money to Dane County. This created $148.3 million in state and local taxes. Without this spending, each resident would pay an additional $700 in taxes annually. There&apos;s more we can do together! Think about your professional organizations and associations-is there a regional or national event that may be a good fit for Madison? Be a tourist in your own town-if there are particular pride points about our city that are appealing to your professional associations, share them! Connect with us-we can share insights and experiences that will make it easy for you to bring key events to town so you can focus on your professional role, or research, within your field. For more information about the Bring Your Meeting Home initiative, contact us by e-mail or by calling 608.255.2537. Or, fill out the form below and we&apos;ll get back to you about all we can do to help Bring Your Meeting Home to Madison!